In this day and age of digital technology, it pays to be really careful about what you do in public because you never know who’s watching you. And if you’re doing something really bad, you could find yourself in a sticky situation and a legal bind since there is solid evidence against you. You could also become the subject of fury from people who’ll likely see your video online. 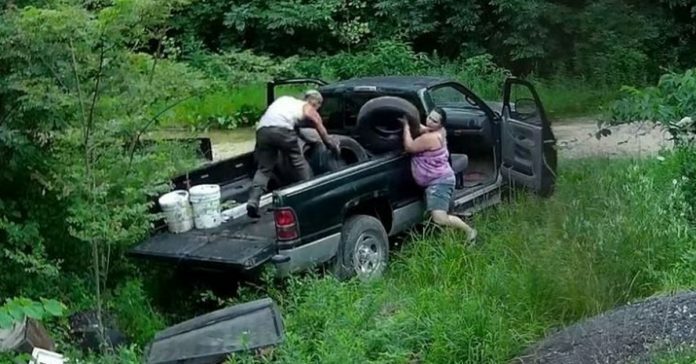 This is what exactly happened to an unsuspecting couple from Ohio, who made the big mistake of dumping their trash in a wildlife preserve. Unknown to them, however, the area had cameras all around and they were not expecting that a video featuring themselves doing something illegal could trend on the Internet. 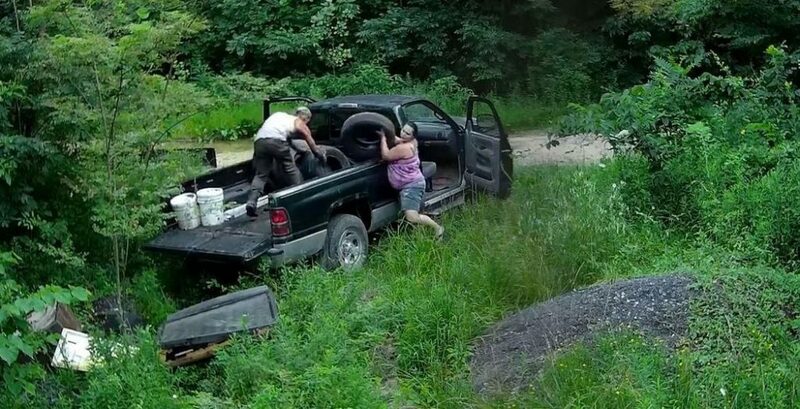 The authorities of the Ohio Division of Wildlife weren’t also expecting that the couple would dump huge piles of trash by the Sand Run Road of the wildlife preserve. Without any care, the littering couple left old tires, destroyed television sets, some plastic pails, hubcaps and just about any junk you can imagine that will likely contaminate and kill the animals living in the preserve. The Ohio Wildlife Preserve is home to over 140 kinds of animals like coyote, black bear, bobcats and a lot of migratory birds. The site is also camp for outdoor enthusiasts and students who are interested to learn about animals. Efforts to conserve or rehabilitate Ohio’s wildlife is community effort and the site is supported by both government and business entities. Mortified by what the couple did, the agency sought the help of the Hocking County Police Department to identify the littering couple. So, the police posted the video on their Facebook page to ask the public’s help to help name the man and woman. And that’s how their faces became news-worthy. The video has received over 1.2 million views and nearly 12,000 shares. Illegal dumping or littering on a state property is considered a misdemeanor in Ohio. The couple also drove a vehicle in an area where cars aren’t actually allowed, which is another misdemeanor. Expectedly, the Facebook post was inundated with comments from the public, who vilified the couple for being worthless filthy animals. Social media netizens were upset that the couple did not care for their environment. However, some went too far by citing that, if caught, the couple should get a maximum sentence for what they did. The police eventually found out the identities of the man and woman released their name in public. Corey Webb and Amanda Pyke, who are from Perry County, confessed that it was them on the video and they were booked at the sheriff’s office. ***UPDATE***UPDATE***UPDATE***UPDATE***Based on tips we received as a direct result of this post, we identified the two individuals. The Ohio Division of Wildlife, with the assistance of the Perry County Sheriff’s Office and their Litter Control Deputy, made contact with the two who confessed to dumping items at multiple locations.Corey Webb and Amanda Pyke, both of Perry County, were charged with Littering on State Property and Operating a Vehicle in a Non-Designated Area, both of which are misdemeanors.The Hocking County Sheriff's Office and the Ohio Division of Wildlife would like to give a big THANK YOU to everyone who assisted with identifying the pair. 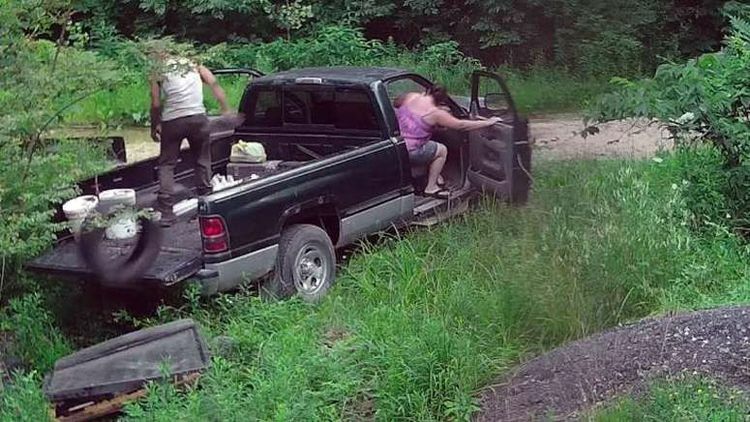 ***UPDATE***UPDATE***UPDATE***UPDATE***The Hocking County Sheriff's Office and the Ohio Division of Wildlife is asking for the public's assistance in identifying two individuals in an trash dumping investigation. 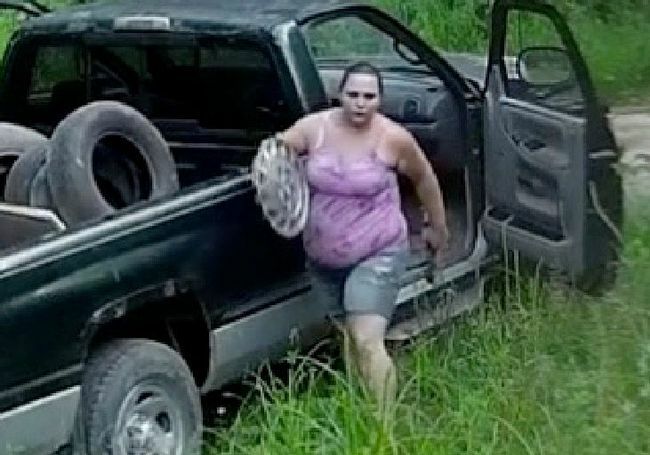 In July, a male and female were captured on video illegally dumping various items inclusing televisions and tires on Sand Run Road in a Wildlife Preserve Area. If you have information on the identity of the two individuals, please contact the Hocking County Sheriff's Office at 740-385-2131 or by sending us a message. The public shaming was necessary to remind the public that it is illegal. It’s also meant to deter other people from also carelessly throwing their trash on other properties. A month later, the couple were charged in court for two counts of misdemeanor. The police said that they also admitted to dumping their junk and trash is multiple locations around the county.